Last update issued on April 27, 2003 at 04:10 UTC. The geomagnetic field was quiet to active on April 26. Solar wind speed ranged between 415 and 483 km/sec. Solar flux measured at 20h UTC on 2.8 GHz was 143.7. The planetary A index was 15 (STAR Ap - based on the mean of three hour interval ap indices: 15.6). Three hour interval K indices: 42433333 (planetary), 32422323 (Boulder). At midnight there were 10 spotted regions on the visible disk. Solar flare activity was high. A total of 7 C and 4 M class events was recorded during the day. Region 10337 decayed slowly. The large penumbra appears to be splitting into two penumbrae. Region 10338 decayed in the trailing spot section and lost all spots there. With polarities thoroughly mixed in the northern central section and a magnetic delta structure in that part of the region, 10338 was very unstable and produced many flares. Flaring is likely to continue until the delta disappears or the region rotates over the northwest limb today and tomorrow. Flares: M2.1 at 00:58, M2.1 at 03:06, major impulsive M7.0 at 08:07, C1.4 at 14:30, C6.0 (with an associated moderate type II radio sweep) at 14:46, C1.3 at 15:43, C5.5 at 16:35, C5.1 at 17:58, C3.8 at 19:41, M2.5 at 23:40 and C1.2 at 23:57 UTC. Region 10342 developed early in the day, then began to decay. Flare: C6.6/1F at 01:51 UTC. Region 10344 developed further. The leading positive polarity field extended into the northwestern part of the trailing negative polarity and this caused a magnetic delta structure to develop. While the delta is not yet strong, the flare potential is increasing and M class flares are possible. Region 10345 decayed slightly but still appears to have a weak delta in the northwestern part of the southern penumbra. Region 10346 was quiet and stable. New region 10347 emerged west of region 10345. New region 10348 emerged in hot plage at a high latitude in the southeast quadrant. New region 10349 rotated into view on April 25 and was numbered the next day. 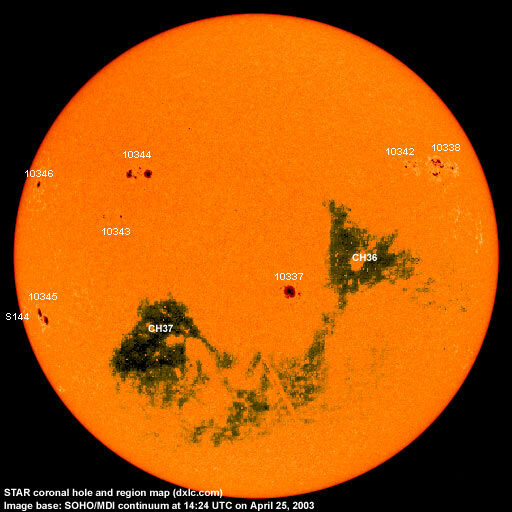 The region is developing quickly and could soon begin producing flares. [S145] A new region emerged on April 26 south of region 10337. Location at midnight: S20W26. 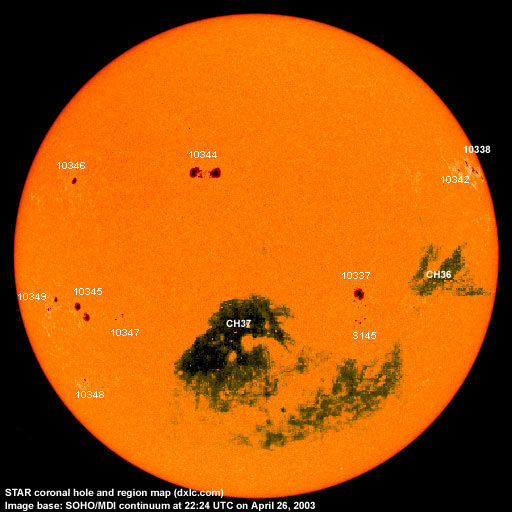 April 24: No obviously geoeffective CMEs observed. April 25: A large CME was observed mainly off of the northeast limb early in the day after an M class event in region 10346. LASCO C3 images indicate that this may have been a full halo CME. In that case a fairly weak impact could be expected on April 28. April 26: Only limited LASCO data available, no CME analysis possible at this time. 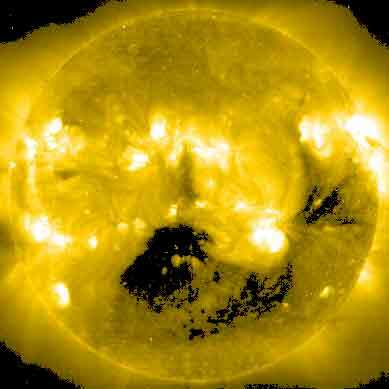 A recurrent trans equatorial coronal hole (CH36) was in a geoeffective position on April 23-24. A recurrent coronal hole (CH37) in the southern hemisphere could rotate into a geoeffective position on April 26-27, CH37 has decreased in size over the last rotation losing its westernmost extensions. CH37 may be located too far to the south to cause any notable geomagnetic disturbance. Processed SOHO EIT 284 image at 01:06 UTC on April 27. Any black areas on the solar disk are likely coronal holes.